Today I found a small flock of about 25 White-faced Ibis, first of the year birds here, in a flooded agricultural field in Florence. I always check each dark ibis to look for the rarish Glossy Ibis, more likely found in eastern U.S., which I usually find in large flocks of around a hundred or so. Surprise, I found not just first of the year White-faced but Glossy Ibis. 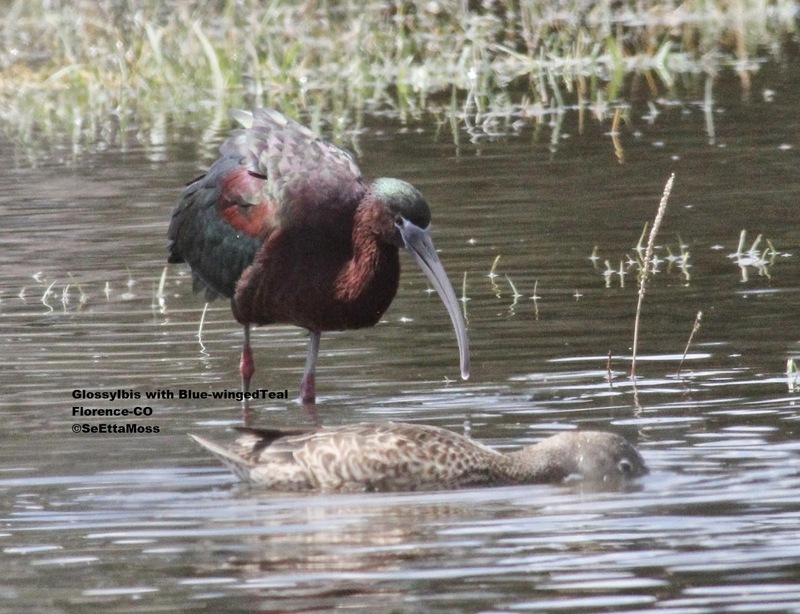 These photos show the bluish bare skin on it's face which are arranged as lines above and below the eye, and not going around the eye as with the bare skin on White-faced Ibis. Though the third photo just above is not as sharp, it is good for showing the difference in facial features of Glossy and White-faced Ibis right next to each other. The forth photo also shows the difference in these species though in a different perspective as they are loafing with heads resting on backs. 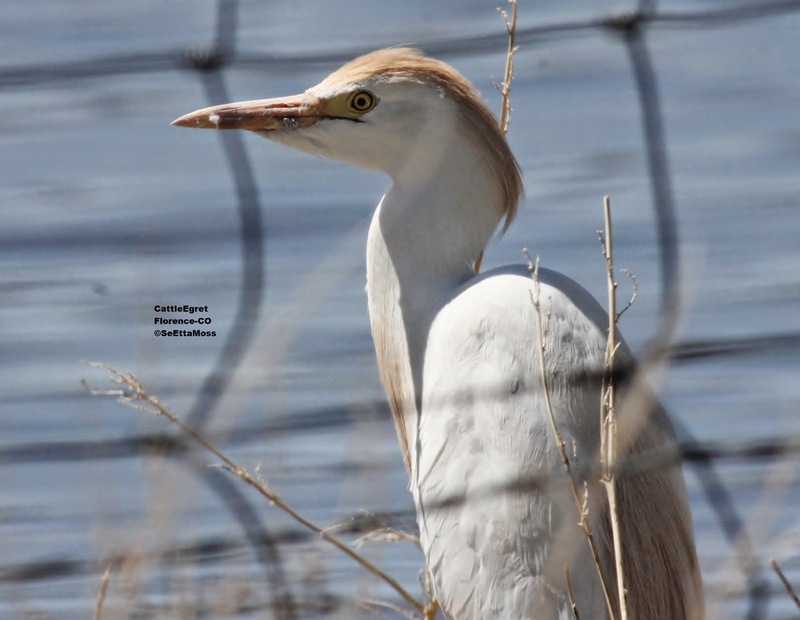 Every spring migrating shorebirds and waterbirds stopover in the Canon City area in flooded agricultural fields. Today I found this Cattle Egret foraging in the wet vegetation around the flooded fields. 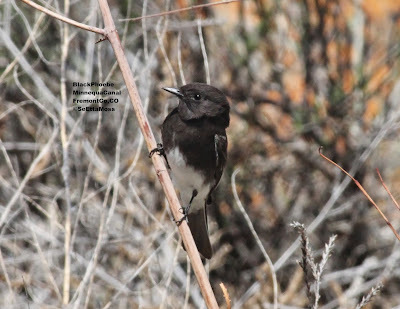 I found this Black Phoebe and it's apparent mate this morning. As I watched this Black Phoebe pulled a piece of nesting material off what looks like a dried reed in the photo below. It flew with this plant fiber to a nesting area where a pair (likely these) used last year and probably at least one year before. 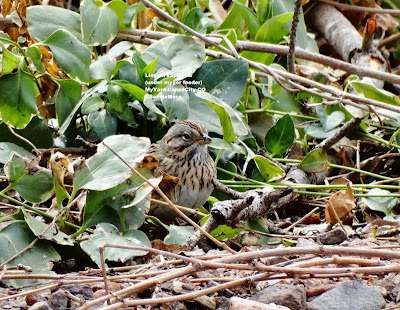 While Lincoln's Sparrows are not rare in south central Colorado, the are not very common with reports more of one or two birds seen more often than multiple birds. 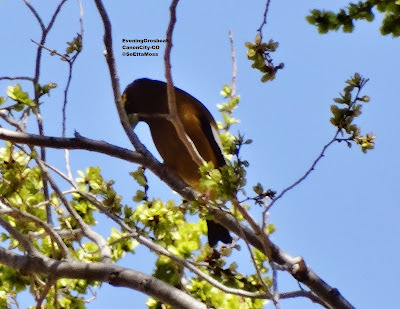 I usually find them skulking in vegetation near the Arkansas River as do others who report them on ebird. While I haven't done a thorough search, most of the reports seem to be from parks, ponds, reservoirs and rivers.